Automative sector is currently developing fast in Azerbaijan, as more plants engaged in the production of cars are being launched across the country. Production of Peugeot cars under the brand name Khazar has been launched in the Neftchala industrial park, spokesperson of the AzerMash company Gunay Namidar told Trend on Thursday. Namidar noted that currently, several Peugeot cars have been manufactured at the plant’s production facilities. Production of cars was organized by AzerMash together with the Iranian automobile company Iran Khodro Industrial Group (IKCO). She added that the price of the Peugeot Khazar car will vary from 19,500 to 21,000 manats depending on the engine size. As previously reported, the main focus of the enterprise will be on increasing the model range, and the next stage provides for the production of two more models - Peugeot 206 and Peugeot 207. In the future, the model range will be increased to nine. Azerbaijan, which is currently working to develop its car industry and encouraging interior purchases, is developing its own automobile manufacturing market. As many as 969 cars were produced in 2018, which is 32.4 times more than in 2017. 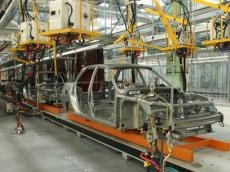 Such a sharp increase in the production of cars in the country was achieved by opening a joint Azerbaijani-Iranian plant Khazar in the Neftchala industrial park on March 29, 2018, during a two-day visit of Iranian President Hassan Rouhani to Azerbaijan..
AzerMash-IKCO, with an annual production of 10,000 vehicles, will produce 6,000 vehicles at the first stage, such as Runna, Samand, Soren, Dena, Peugeot, Reno, by the end of 2019. The enterprise is expected to export 2,000 vehicles annually. Khazar cars are expected to be exported, first of all to the Russian market, then to be delivered also to Ukraine and Central Asian countries in the future. A major Iranian automaker Iran Khodro and Azerbaijani company Azeurocar, a subsidiary of AzerMash, signed an agreement on August 6, 2016 to establish a joint automobile plant in the Neftchala Industrial Zone. The total cost of the project is estimated at $ 14.08 million. Azerbaijan. Azerbaijan holds 75 percent share while 25 percent belongs to Iran. Regarding the quality, brand received a quality certificate of "Euro 5". Cars have been sold since summer 2018.